Located over the train lines on Krondorf Rd coming into Tanunda (from Adelaide), Rockford’s prides itself on traditional values, hand made wines and quality fruit. 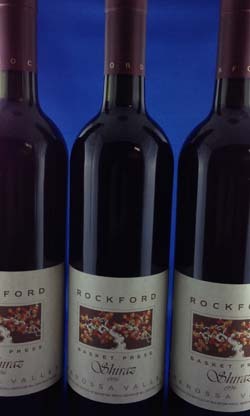 Having a reputation for quality, it has amassed a loyal following, and its premium wines are very hard to get outside of South Australia with the rarest releases only available to select members of the “Stonewallers”, a private club managed by the winery. The flagship, old vine Shiraz with a fanatical following of wine enthusiasts. An elegant, traditionally made Barossa Shiraz of finely, focussed fruit. Good vintages can sell upwards of $120+ at auction. The problem for anyone considering this wine for a quick profit is that the release is carefully managed and availability is restricted to cellar door, restaurants and a handful of bottles shops around Australia. The first vintage was 1984. Some of these bottles still come up at auction, although very rarely. Unfortunately the wine is past its drinking window at this point, but as a collectible it has been known to fetch up to $300 at auction. The better vintages from the 90’s are drinking superbly at the moment (2014), and still have quite a few more years left in them (Use google to search the internet for recent vertical tastings). Remember, magnums have more volume and therefore age slower, a vintage that is starting to show its age in bottle may still be quite youthful in magnum, just make sure you have a few friends around to help you consume it. Rockford’s have a special club that you may be invited to join called the stonewallers. It is by special invite only for consistent, loyal customers. You get an attachment for your keying and access to a special, stonewallers only, tasting room at the winery. Other advantages are access to some of the rarer wines and early access to the release of the annual Basket Press Shiraz. As a "stonewaller" you can buy the Single vineyard wines (as well as early and less costly access to each vintage of their Basket Press Shiraz), produced only in epic vintages. Because of their exclusivity, reputation for quality and limited quantity there is a large premium paid for these wines at auction. The disgorgement date is 5 years old at release. Unique to Australian wine connoisseurs and with the potential to age (fantastically), sparkling Shiraz has a history going back over 100 years. Some of the older sparkling Shiraz from the turn of the century, whilst not retaining its bubbles, is drinking remarkably well. The process that gives these wines their fizz can also preserve them so much longer than their still cousins. Whilst the Rockford’s sparkling shiraz can not yet claim the same pedigree of the classics (such as the Seppelt sparkling shiraz) their continual quality may make them a contender in decades to come, although many people complain of older vintages weeping and problems with the corks, it may not just be a Rockford’s problem and perhaps we should be hoping for crown seals in all sparkling wines in the near future. There are two versions of the 1998 Basket Press Shiraz. The original release and the Winemakers release. The back label on the second release is clearly marked “Winemakers Release”. According to the winery there is no noticeable difference between the two releases. However, the second release did spend more time in oak and hearsay from various tasters puts the second one as slightly more oaky that the first when tasted side by side. Still an elegant Shiraz, and not overly oaky in the first place, both are still marvellous wines BUT occasionally the winemakers release sells for less. Why? Its hard to say as we have interviewed a number of the buyers and they buy for totally different reasons, but the majority perceive that the 2nd release is the lesser quality wine hence the occasional price variation. It can be a very interesting look into the perception of quality and how it can affect demand and pricing. Values have been aggregated from national secondary market data. Typically, price clusters form over time at market value. The low value is then calculated from the average accumulated hammer price at auction from multiple Australian wine auction houses over a 6 month period. All prices are for bottles with no damage or ullage. Well stored bottles with a documented purchase and storage history will always attract the best prices.